In a world where ‘clean eating’ is a term commonly used, Dirty Bones must be the antichrist. An indecent yin to its yang. Sat on top of the Westgate shopping centre‘s roof terrace, in a prime corner plot, the American restaurant and cocktail bar commands views over Oxfordshire from its own terrace dining area. A recent visit produced a thoroughly enjoyable meal of the filthiest proportions that would satisfy any ‘cheat meal’, with my husband proclaiming it the perfect post-training meal and me wondering how often a person could eat that way without negative health implications. I don’t think anyone is expecting you to eat here daily though, it’s a treat or destination venue. But one that comes with good quality grub that’ll have you licking your fingers and whipping out your iPhone for a cracking Insta story of you tearing meat off bones and wiping sauce from your face. 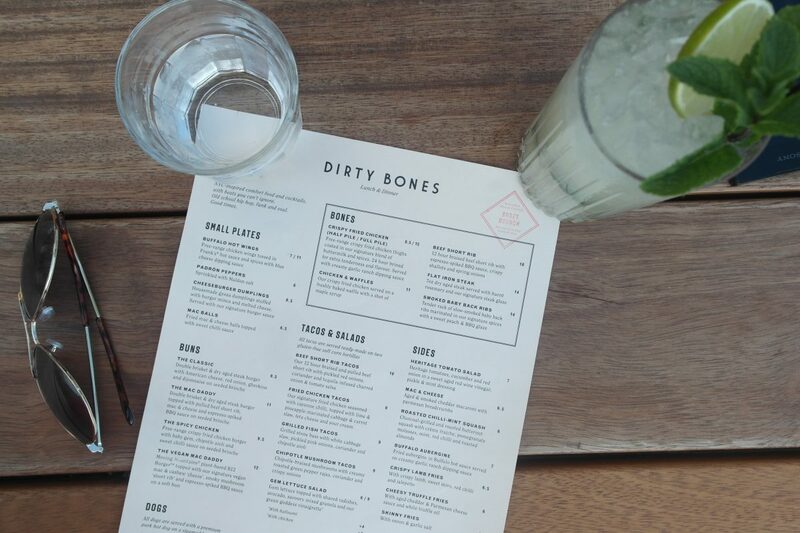 So, what do you order when you visit somewhere called Dirty Bones? Well, apparently I order a salad. Yeah, I don’t know what I was thinking either, take it as a token gesture at being virtuous. We went to town beyond that though. 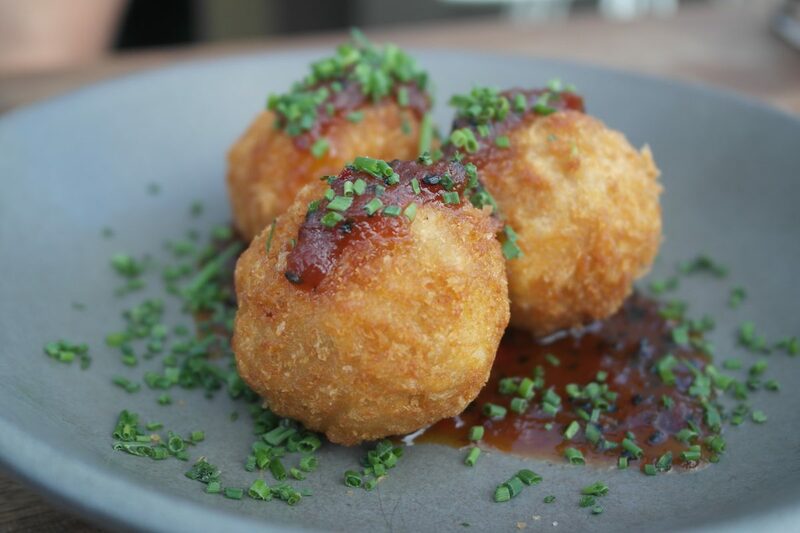 Mac & Cheese balls (£6.50) plus Buffalo Hot Wings (£7) to start, followed by a Spicy Chicken Bun (£9.50) and Beef Short Rib (£18) for main, the ‘The Stickiest Toffee Pudding’ (£6) and Butter Baby shake (£5) for pudding. 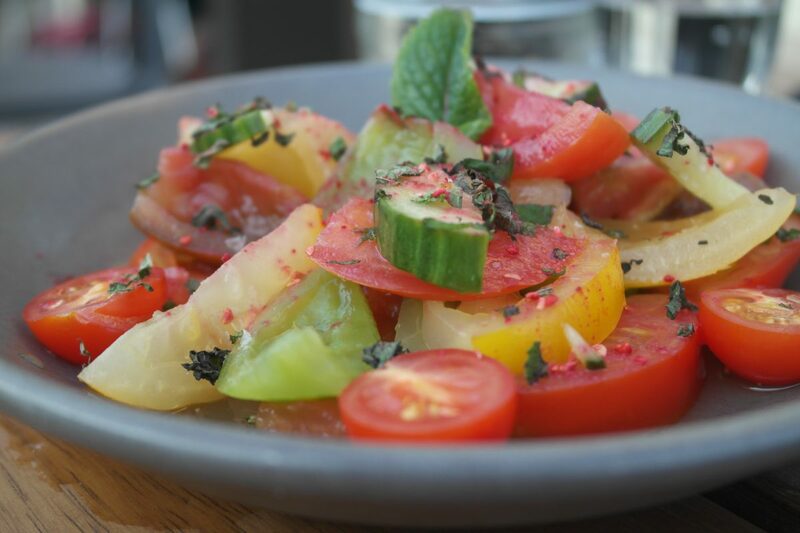 The salad – in case you are interested – was a side of heritage tomatoes (£7), served with cucumber, red onion, mint and red wine vinegar. A bit too watery for me but that’ll teach me not to make token gestures. 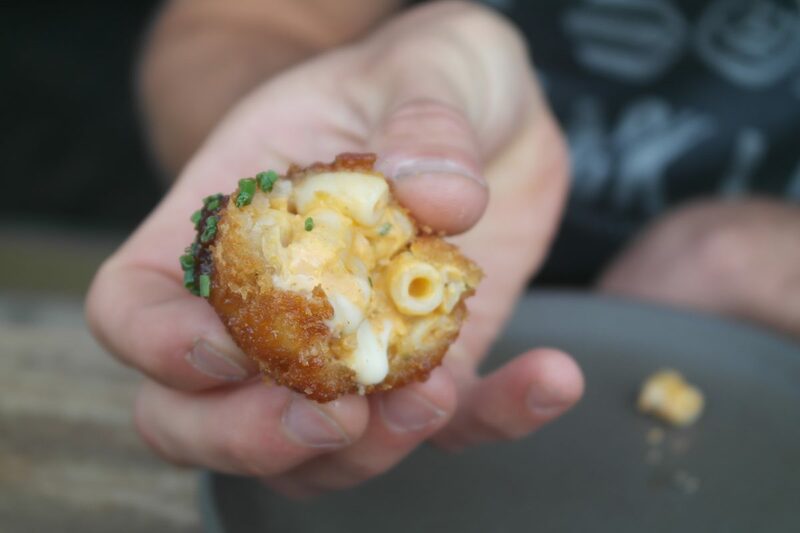 The mac balls and wings elicited the first groans of the evening – a comforting combination of crispy and soft, sweet and savoury, with oozy bits in all the right places and glistening in the golden glow only good fried food can offer. Dry macaroni cheese is a horrid thing. This, thankfully, was not. 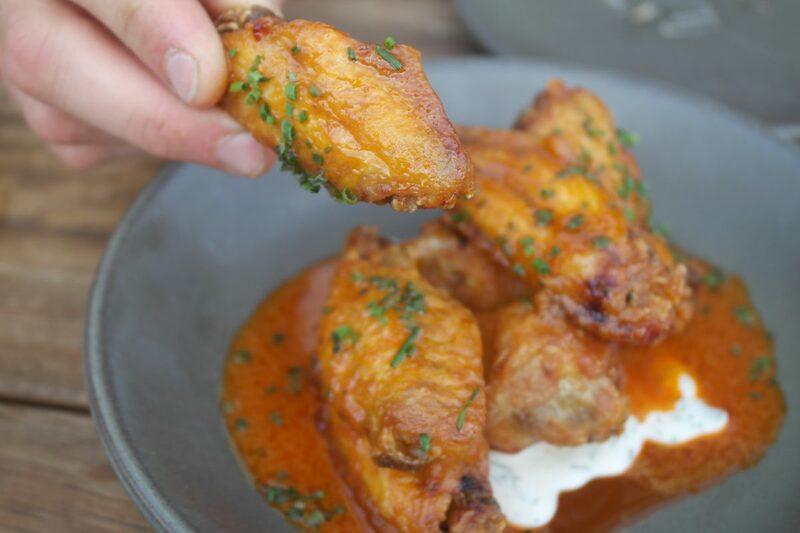 Wings were good too – fiery enough to tingle, drenched in enough Frank’s hot sauce (my favourite) to satisfy and meaty enough to bite. Filth levels at medium, we went on mains. I almost made a schoolboy error and ordered a steak. The very clever waiter directed to me to Beef Short Rib, and for this, I am truly grateful. I often use steak as a test of basic kitchen skills, a litmus test so to speak. But, as he rightly pointed out, steak isn’t their speciality. Check out the pictures below – way better than steak, a big hunk o’ meat arrived in front of me. Braised for 12 hours and rendered down beautifully – the huge knife that arrived with it was entirely redundant, the meat falling apart under the merest of pressure. 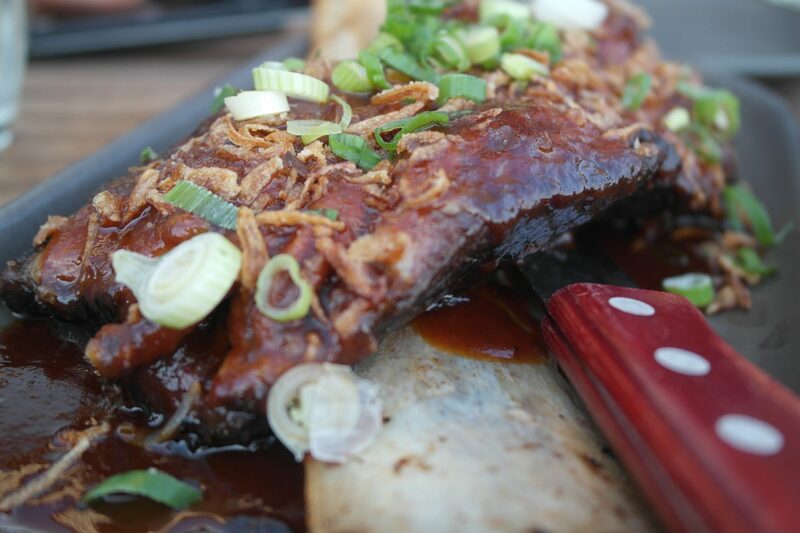 The rib came doused in an espresso-spiked BBQ sauce, topped with crispy shallots and sliced spring onion. The tomato salad was there too, but you know, beef rib! I forgot to mention the other half ordered Cheese Truffle Fries too (£6), which were pretty immense. But to be honest, they were way beyond me at this point and I was grateful of the salad to balance it all out a bit, a welcome reprieve from the rich dishes. 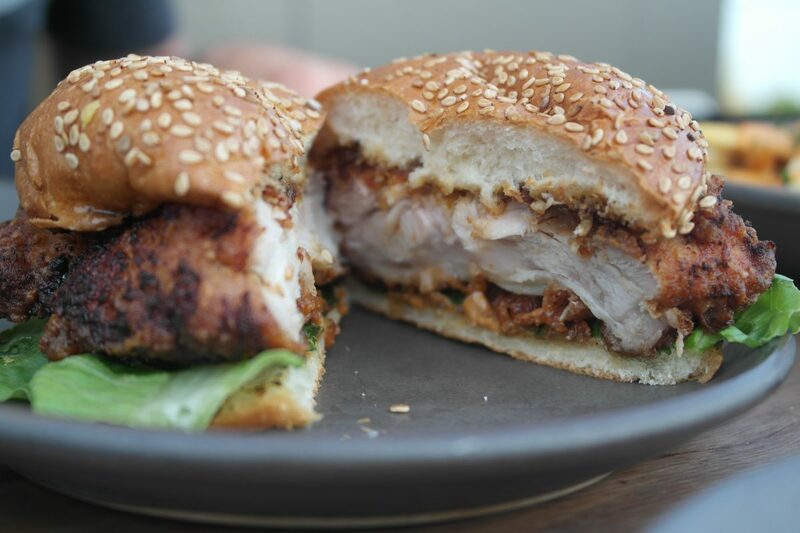 He was enjoying his chicken burger next to me – so much so it was gone before I could even ask for a bite. Pretty sure he does that on purpose. I was told it was good though, and you can see from the pics below that it maintained good moisture in the middle, with a good crispy browned exterior. Served in a seeded brioche with chipotle aioli, sweet chilli and little gem. Filth levels were now at maximum. Out of sheer obligation to you, our readers, and not because I quite like sticky toffee pudding…, we ventured on. Into the pudding realm. 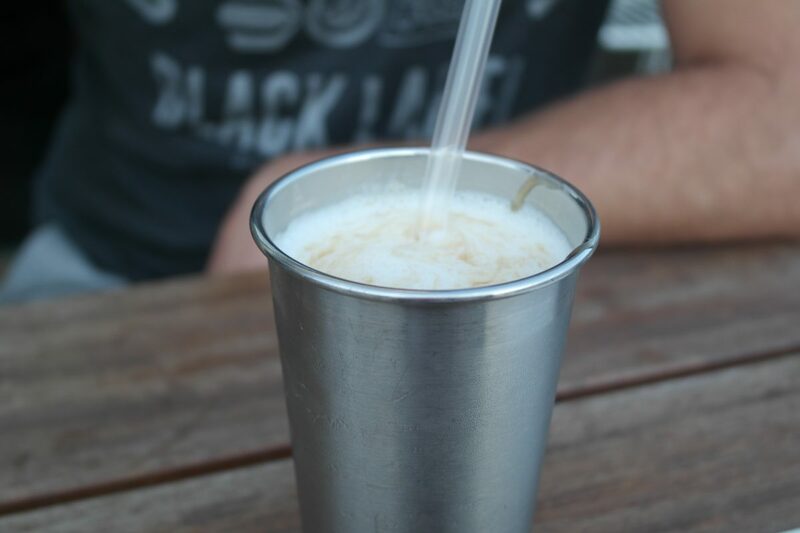 Mr T was lagging but drove on with his rather pleasant milkshake of butterscotch, vanilla ice cream and milk – which you can add a shot of vodka to for an extra £2.50. I held strong and dove into my sticky toffee. For about two mouthfuls. Utterly beaten, the sheer indulgence of the pud overcame me and I could no longer consume. It was delicious, but when you’re under five and a half foot there’s only so much room. 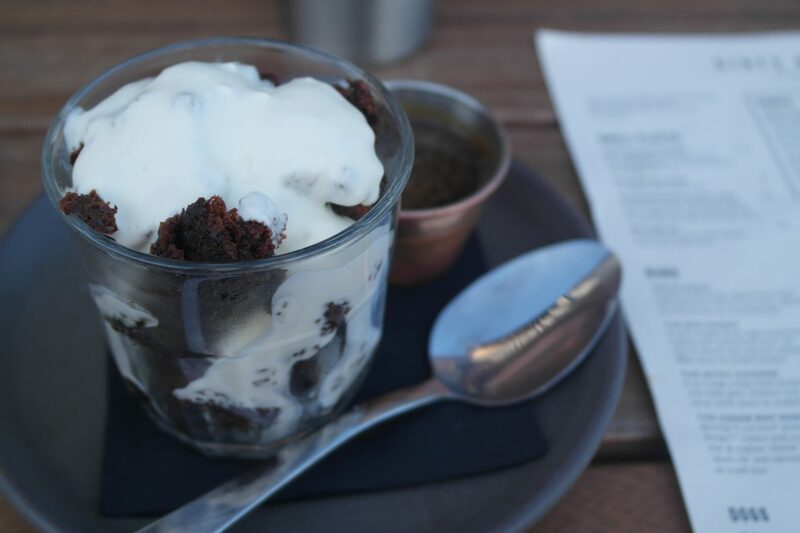 Described on the menu as a warm sticky toffee pudding cup with butter-rum sauce, creme fraiche and sea salt, my pud was comfort food to the extreme and tasty to boot. I was roll-me-home-like-a-barrel done. Dead. Broken. But happily so. I got home alive, slept like a baby and googled healthy meal prep for the next week. As we always hear, life is about balance. Be good most of the time and you can be naughty when needs must. I’m totally down with that concept, and I’d happily be naughty here again. We’d been to Taco Bandits recently so didn’t try the tacos at Dirty Bones, but they look damn good. 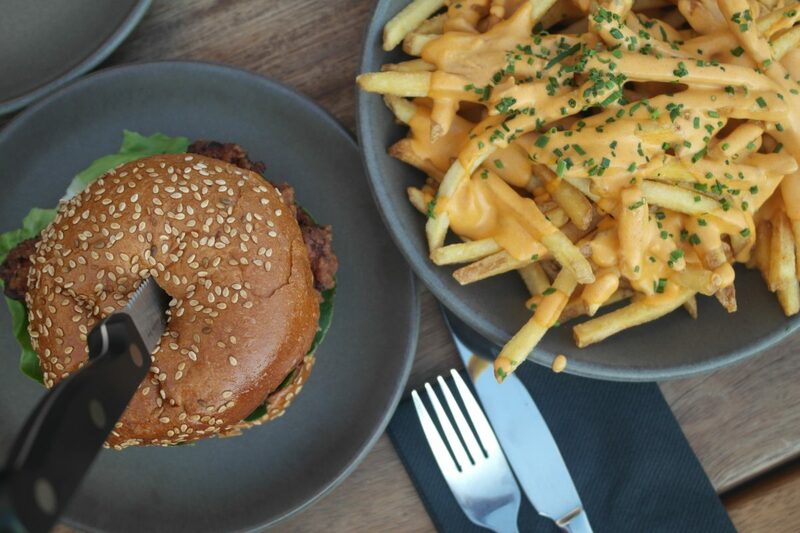 Limited vegan options are also available, and I was pleased to see chicken was highlighted as free range – which I try to stick to when I am eating meat. Dirty Bones have run vegan pop-ups in the past, so it’s worth keeping an eye out for these if you are interested. We dined as guests of Dirty Bones.